There is nothing more exciting to most photographers than a beautiful sky at sunset, except for a silhouetted subject in front of it. 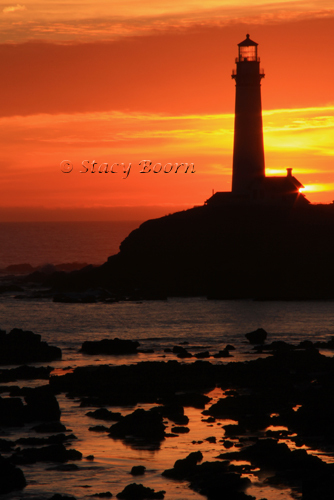 I had both these elements before me last week at Pigeon Point Lighthouse. Sunset photography can be an exposure challenge. I suggest you set your camera on the spot metering mode and select a location about 30 degrees off the sun. Take your reading and dial it in manually. Or you can set your camera for negative compensation of 2/3 to 2 stops, and watch your histogram. 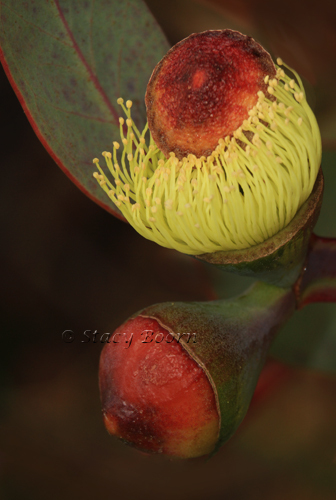 Budding and blooming Eucalyptus plants are among my favorite floral subjects. As the bud begins to open it throws off its cap like a French Brett being tossed aside so one can let the wind blow through her hair. I was using my 100 – 400mm lens at 400 mm with a 12mm extension tube. Extension tubes are designed to enable a lens to focus closer than its normal set minimum focusing distance. Getting closer has the effect of magnifying your subject (making it appear larger in the viewfinder and in your pictures). They are exceptionally useful for macro photography, enabling you to convert almost any lens into a macro lens. Using 400 mm instead of 100mm or wider helps me narrow the background and keep out competing and distracting colors or subjects. I also use a relatively shallow depth of field (f/8) so that nothing in the background is in focus. Usually the Eucalyptus blooms are far above my eye level but at the Santa Cruz Arboretum there are some young trees making this subject more accessible. But by noon my hair was blowing in the wind and so were the floral subjects. There is a reason to get up and out before sun rise!